Three developed trails take visitors on self-guiding tours ranging from 5 minutes to 30 minutes roundtrip. Water, restrooms and picnic tables are available. Boca Negra Canyon is open 8:30am-4:30pm seven days a week and is closed January 1st, Thanksgiving Day, and December 25th. The park is located just north of Montano Road at 6900 Unser NW. 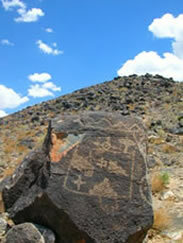 NOTE: While Boca Negra is part of the Petroglyph National Monument, the Facility is managed by the City of Albuquerque Open Space Division. For inquires about Boca Negra Canyon, please call 505-452-5200. To report suspicious activity or vehicle lock-ins, please call 242-COPS.